Listed as a Heritage Icon by the National Trust of South Australia, The 2010 Grange received three perfect 100 point scores from leading wine critics including Tyson Stelzer, Andrew Caillard MW and Nick Stock. Penfolds winemakers said that outstanding vintage conditions produced fruit with excellent colour, concentrated flavour development and integrated tannins to make a fitting release for this significant 170 year anniversary for Penfolds. One bottle each of Penfolds Grange 2010. For more information on this wine, please see the Tasting Notes. Limited Edition Signature Penfolds Box. This fine wine gift is presented in Penfolds' exclusive wooden gift box with red accent enclosures. A complimentary card with your personal message or greeting is included with your gift. Measures 14" x 5" x 4". if ordered by 3:00 am EDT Monday April 22nd. Penfolds Grange 2010 Gift Box is a hand delivered gift. These gifts are delivered by one of our local design centers located throughout the United States and Canada. Same day delivery is available for most gifts when ordered before the cutoff time. 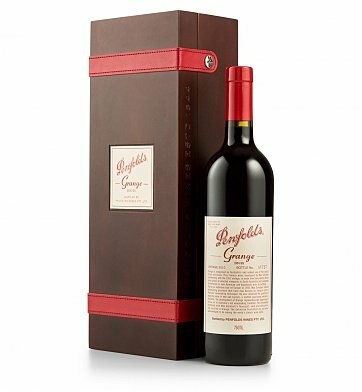 The cutoff time for Penfolds Grange 2010 Gift Box is in the recipient's time zone. Penfolds Grange Bin 95 2010The 2010 Grange arrives with much expectation and does not disappoint. This is a powerhouse, structurally superior to both the 2009 and 2008 vintages and breathtakingly dense, long and precise. The nose has cola, blackberry, vanillin, hard brown spices of all kinds, coal smoke, meaty charcuterie elements and a strong tarry, savory note. Black to the core, purple on the rim. An intense nose. An immediate barrel-ferment propulsion sweet and candied, with a peaty, iodine, green olive base. Beneath this, a barely-concealed swirl of Vegemite, yeast extract, concentrated salt-paste - laced with paprika, oregano flower and thyme. A slurry of cocoa powder, a scented waft of black pudding, and a splash of nori-roll, sea-spray temporarily balance this aromatic equation. The palate is dense, with a paste-like texture and weight. A balsamic liveliness, lift, and energy is unleashed. Tannins focus on the roof of the mouth, laden with an additional film of (85% cacao) dark chocolate, mocha. A mix of quince and sesame-paste laden with basted meats and saturated stewed plum, boysenberry, blueberry. Tightly bound wait for decompression! Complete, Confident, Convincing. 100 Points by James Suckling. One bottle of 2010 Penfolds Grange, a dry Australian red. Presented in Penfolds' signature enduring wooden wine crate. Includes complimentary card with your personal gift message.